The New Faull Inn players are bottom row, L – R: Jim Pelletier, Mo Fowler, Jay Linden, Rich Server, Mike Stiller, Nick Kotzalas. Top row, L-R: John Skaggs, Jake Marzucco, Bob MacMahan, Charlie Bowers, Jay Orgovan, Phil McGouldrick, Jerry Foley. Not shown...Mickey Muzevich. Landy’s Orange Crush team members are Bottom row, L - R: Ray Murphy, Gerry Wolfe, Bill Rice, George Schwager, Mike Wunderlin, John Judkins. Top row, L-R: Greg Brezicki, Frank Spencer, Tim Horvath, Nolan Crawford, Tim Schwob, John Skaggs, Gerald Breathol, Mickey Muzevich, Jack Smith. The Englewood Men’s Senior Softball league concluded the 2019 season last week, a season once again highlighted by close competition in both the Gold division and Silver division, and first ever season of play in the new Bronze division. Landy’s Orange Crush pulled off the championship in the Silver division. In the Gold division, New Faull Inn had a solid grip on first place from the first week of play. (See page 6 for photo) The new Bronze division is for “super seniors,” specifically for players 80 and older who are no longer able to play in the Silver division. At the post season banquet on March 28, awards were presented to the division champions and the first ever Iron Man award recipients, Russ Evans and Khaki Markle, who are still going strong in their early 90’s. Rich Entlich who is retiring following a long-playing career and league commissioner, received the first ever Mike Scofield Legacy Award. For those of you who will be 60 or over in 2020, or those who are already age eligible, can join the fun, open practices held at 8:30am every Monday, Wednesday and Friday at the Englewood Sports Complex, April – December. Those interested in playing can register for next year at englewoodseniorsoftball.weebly.com. The Englewood Men’s Senior Softball league concluded the 2019 season last week, a season once again highlighted by close competition in both the Gold division and Silver division, and first ever season of play in the new Bronze division. Landy’s Orange Crush pulled off the championship in the Silver division. In the Gold division, New Faull Inn had a solid grip on first place from the first week of play. (See page 6 for photo) The new Bronze division is for “super seniors,” specifically for players 80 and older who are no longer able to play in the Silver division. At the post season banquet on March 28, awards were presented to the division champions and the first ever Iron Man award recipients, Russ Evans and Khaki Markle, who are still going strong in their early 90’s. Rich Entlich who is retiring following a long-playing career and league commissioner, received the first ever Mike Scofield Legacy Award. For those of you who will be 60 or over in 2020, or those who are already age eligible, can join the fun, open practices held at 8:30am every Monday, Wednesday and Friday at the Englewood Sports Complex, April – December. 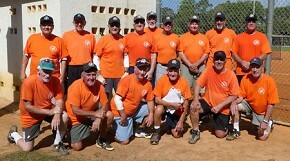 Those interested in playing can register for next year at englewoodseniorsoftThe Englewood Men’s Senior Softball league concluded the 2019 season last week, a season once again highlighted by close competition in both the Gold division and Silver division, and first ever season of play in the new Bronze division. Landy’s Orange Crush pulled off the championship in the Silver division. In the Gold division, New Faull Inn had a solid grip on first place from the first week of play. (See page 6 for photo) The new Bronze division is for “super seniors,” specifically for players 80 and older who are no longer able to play in the Silver division. At the post season banquet on March 28, awards were presented to the division champions and the first ever Iron Man award recipients, Russ Evans and Khaki Markle, who are still going strong in their early 90’s. Rich Entlich who is retiring following a long-playing career and league commissioner, received the first ever Mike Scofield Legacy Award. For those of you who will be 60 or over in 2020, or those who are already age eligible, can join the fun, open practices held at 8:30am every Monday, Wednesday and Friday at the Englewood Sports Complex, April – December. Those interested in playing can register for next year at englewoodseniorsoftball.weebly.com.